"The Victoria Insurance Co. Ltd. (Established 1849) The Oldest Australian Office"
"All Classes of Insurance Transacted (except Life) - Local Agent - Mr. R. W. Clark"
"Ten years ago Mr. Roger Clark settled in the district under the repatriation scheme, and later acquired an adjoining block so that he now owns 1,788 acres. All of it is cleared and 1,000 acres is first class country. Mr. Clark served with the 28th Battalion and subsequently with the 2nd Machine Gun Battalion, and was on Gallipoli Peninsula and France. He is now captain of the Carnamah Rifle Club. This season he cropped 790 acres of wheat principally on fallow, the average yield being 21 bushels. About 450 acres were on his best land. His [wheat] varieties are Nabawa, Bena, Gresley and Merredin and he follows a three-year rotation. Gresley has been grown with much success for nine years, and this season so high a yield as 12 bags was obtained from it. Gresley is always cut for hay. The property is running 700 sheep at present, and 300 acres have been fallowed for next season. There is a plentiful supply of water from five wells." "The president of the Carnamah District Agricultural Society (Mr. R. W. Clark), is an Englishman, having been born in Hertfordshire about 40 years ago. 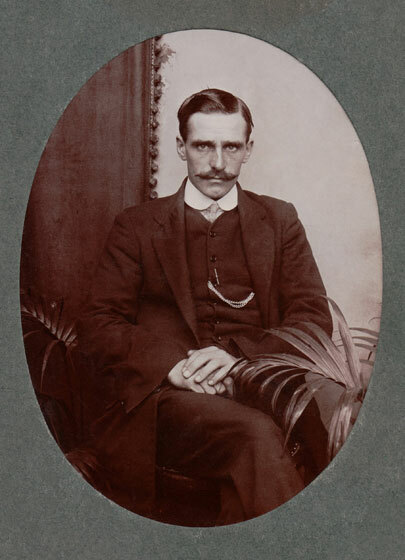 After completing his school days he migrated to Western Australia, where he soon found employment in the Irwin district, where he acquired a sound knowledge of farming and pastoral pursuits. At the outbreak of the Great War, Mr. Clark enlisted in the A.I.F., and attained the rank of sergeant. Returning to Western Australia he acquired a farming property at Carnamah, which today is one of the many fine farming propositions in the district. Mr. Clark takes a prominent part in the social amenities of the district, and hold executive positions on most of the organisations created for the advancement and welfare of the district. The excellent financial result of the Agricultural Society's recent show speaks volumes for his organising ability."